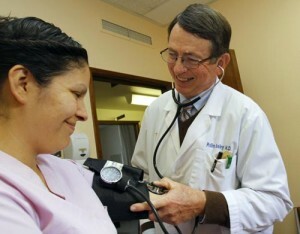 It seems Lompoc physician Dr. Rollin Bailey just keeps getting awards. In 2010, he was named "Physician of the Year" at the Lompoc Valley Medical Center, and in 2011 not only was he named "Favorite Physician in Lompoc" in a Lompoc Record reader's poll, he was also named "Physician of the Year" by the Santa Barbara County Medical Society (SBCMS). Improving patients’ perceptions of the care they receive has been a major goal of the hospital’s staff members since relocating last year from a 65-year-old building on Hickory Street to a brand-new facility on East Ocean Avenue. Based on a patient survey conducted by NRC Picker, a national health-care research corporation, Lompoc Valley Medical Center is one of the most improved hospitals in the corporation’s national membership group. Continue Reading at Santa Maria Sun's website. Lompoc Valley Medical Center has been named a winner of NRC Picker’s second annual Path to Excellence award, which recognizes healthcare organizations for their dedication to improving the patient experience. As an award recipient, you were selected from NRC Picker’s extensive database of members, ranging from small specialty hospitals to large multi-hospital systems, for achieving NRC Picker’s Path to Excellence Award. You have won the Most Improvement Member Award. One year ago today the power at the old hospital that serviced our community for over 60 years was turned off and it was officially closed. 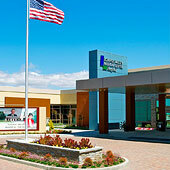 All patients were safely transferred to 1515 East Ocean Avenue and the new hospital took a breath and came to life. It was a remarkable accomplishment and it has been a remarkable year. On behalf of BETA Healthcare Group (BETA) congratulated our Labor & Delivery team for successfully completing the Quest for Zero: OB. As a result of this achievement, Lompoc Valley Medical Center (LVMC) has been awarded a nine percent (9%) contribution credit. Additionally, LVMC will receive BETA's coveted Quest for Zero: OB trophy so that we may share our success with patients and all others who visit the hospital and your department. The Santa Ynez Valley Cottage Hospital (SYVCH) Auxiliary Annual Picnic was held May 13, when scholarships of $3,000 each were awarded to three students. The SYVCH Auxiliary is extremely proud of the 2011 recipients and past scholarship recipients, who have given updates on their careers, officials said. A 2005 awardee, Ashley Foxen, is now on the nursing staff of Lompoc Valley Medical Center. The 2007 recipient, Kathryn Mercado, is beginning her nursing career at UCLA. Completing the senior year at Cabrillo means Senior Projects. Thomas White, Cabrillo High School Senior designed T –Shirts commemorating the schools 45 years of Baseball. White used the project to raise funds for the planned Radiation Oncology Center that will likely be built near the new Lompoc Valley Medical Center. White reports, “shirts were sold for $20.00 and 175 were purchased by the many generous Lompoc Valley supporters”. 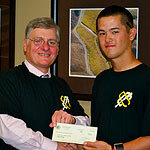 White is seen here presenting a check a $1000 to Lompoc Valley Medical Center's Chief Executive Officer Jim Raggio.